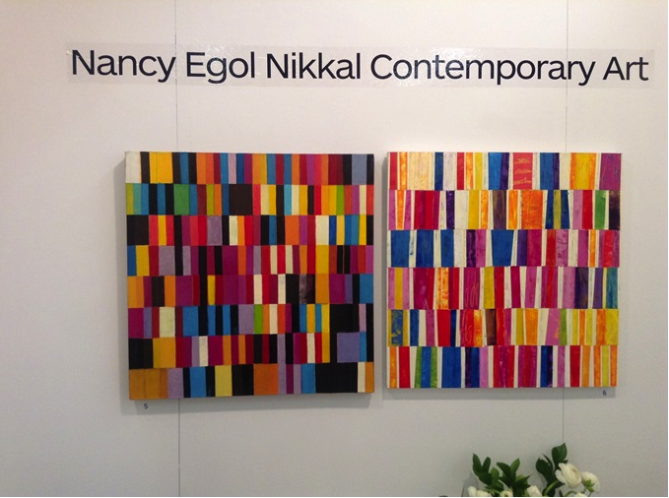 I exhibited original collage paintings at the Architectural Digest Home Design Show at Pier 94 in NYC from March 21-24, 2013. I planned my booth (M135) and designed it to be all about bright colors – hot pinks, warm reds, greens, blues, darks and whites to make the colors ping. Every piece of art – every painting and collage that I hung in the booth was selected for its color in order to attract an audience. And it did. The 2 images below are installed as a diptych – 2 works hung together as one. They are titled Musical Notes 1 and 2. The work on the left is a painting in acrylic on canvas, 24×24 inches. The work on the right is a collage with acrylic painted papers on a 24×24 inch wood panel. My studio practice is mainly collage, but I love to paint so some works are paintings and some works are painted paper collage. The image above was taken by Marcy Michaud. She wrote a blog about the show and included my image. When I do painted paper collage, I paint papers first, and then, when the paint is dry, I play with cut paper blocks and organize them into grid patterns. I almost always work with a grid. Sometimes I change the size and shape of the papers as I make the collage. Sometimes I paint back into the papers after they are glued down. The color relationships are the most important part of each work. The images below are 2 collages with painted papers and assorted magazine papers, framed size 13.5″x16″. 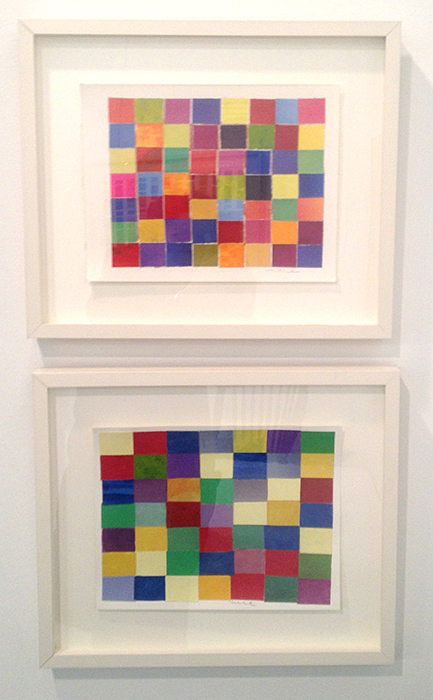 The works are titled Color Game Hidden Spaces (top) and Color Game Green & Red (bottom). They were installed on a side wall in my booth. On the opposite wall, I hung a horizontal framed collage I titled DNA. See the image below. I want people to be attracted to the power of color. It’s painted paper collage on paper, framed: 22″ x29.5″, 2012. 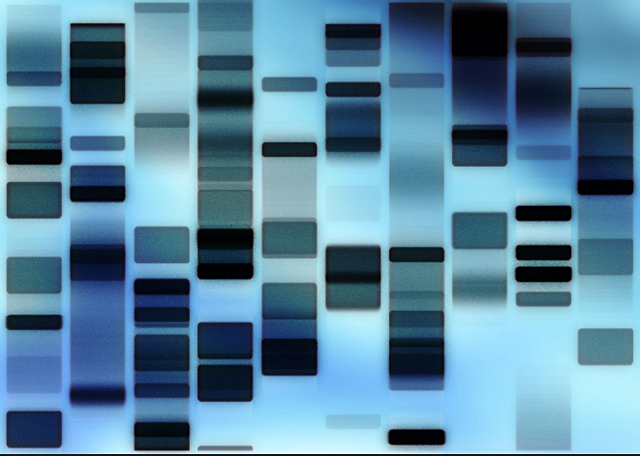 I was asked – why did I title the collage DNA? Answer: The color blocks made me think of uncurled strands of DNA. A little bit. My approach to naming the art was very unscientific. Someone said: DNA would only show in 4 colors. My collage had more than 4. I had 3 greens, 2 blues, a red-purple, a reddish brown and several yellows. See the image below (image courtesy the Internet). It’s an uncurled strand of DNA that does look a little like my collage. I know my collage DNA included too many colors – but I love color. People want to see variety, especially at a trade show. So I included about 30 additional unframed works for all the people who visited my booth to look at and hold. I tucked these smaller unframed collages into 11”x14” clear vinyl slipcases and placed them in an art bin freestanding on the floor. Each vinyl slipcase was numbered to match a price list with titles, image sizes and media for each work. Many works in the bin combined printmaking, drawing and collage. The image below is titled Random Squares in a Grid 2 (Brown & White Stripes). 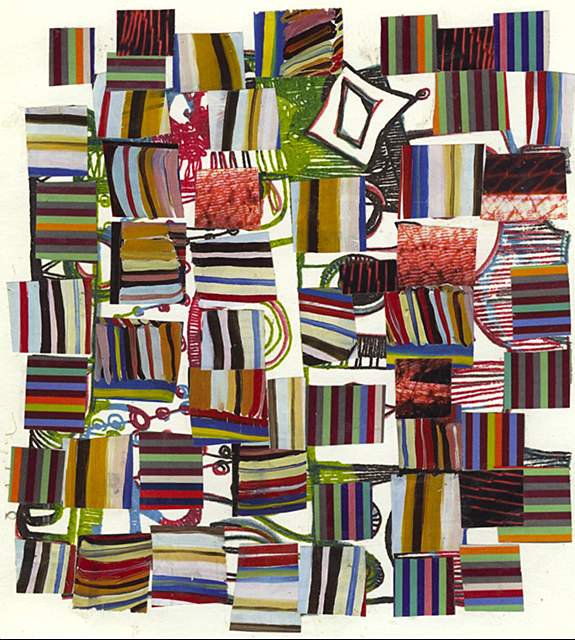 It’s collage with assorted papers and acrylic on paper, 11.5″ x 11.5″, 2011. The image below is titled Random Squares in a Grid 7 (Azo Yellow). 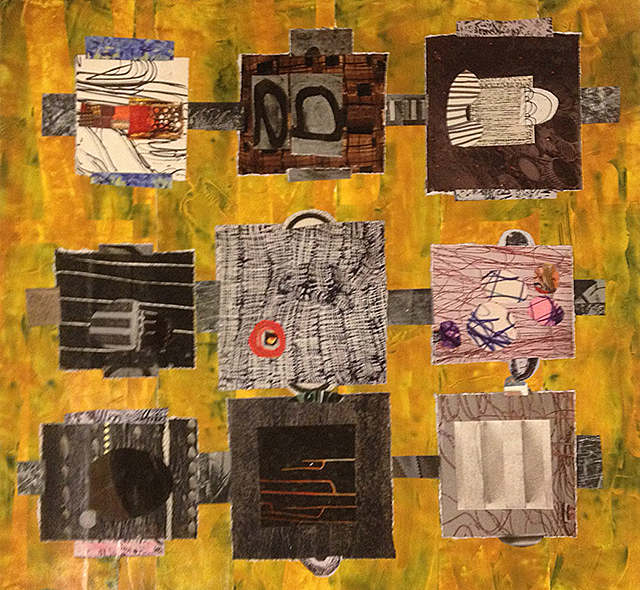 Its a collage with assorted papers over painted paper, 11″ x 12″, 2011. It pleased me that people took time to handle the unframed works. People like to touch. I took the works out of the slipcases so they could see and touch the surfaces. 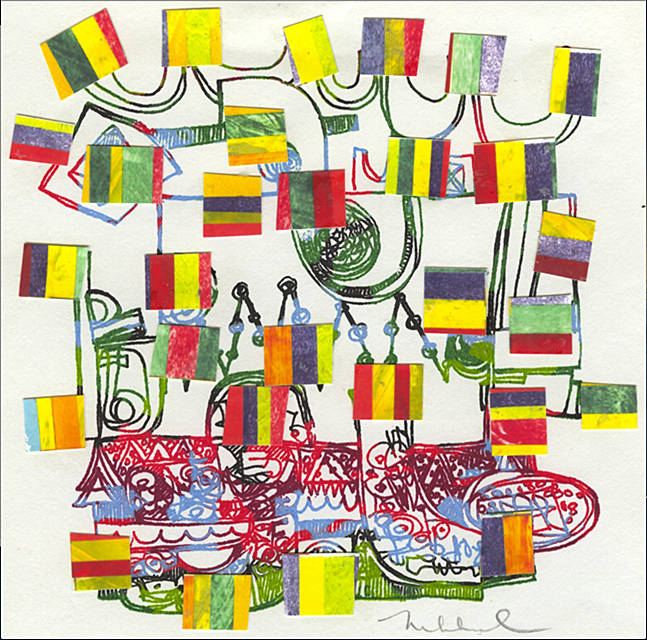 The image below is a collage of colorful striped papers on top of a silkscreen print card (the card is a print from an original drawing). I like to collage over hand-made cards. 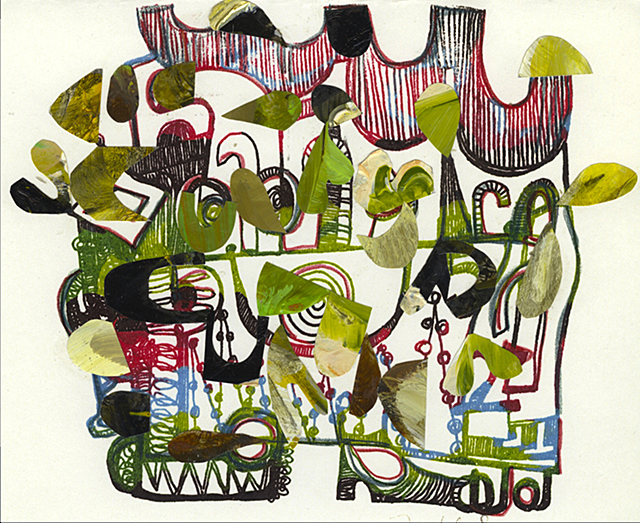 The paper is fine printmaking quality, folded like a card, 8″ x 7″, 2013. 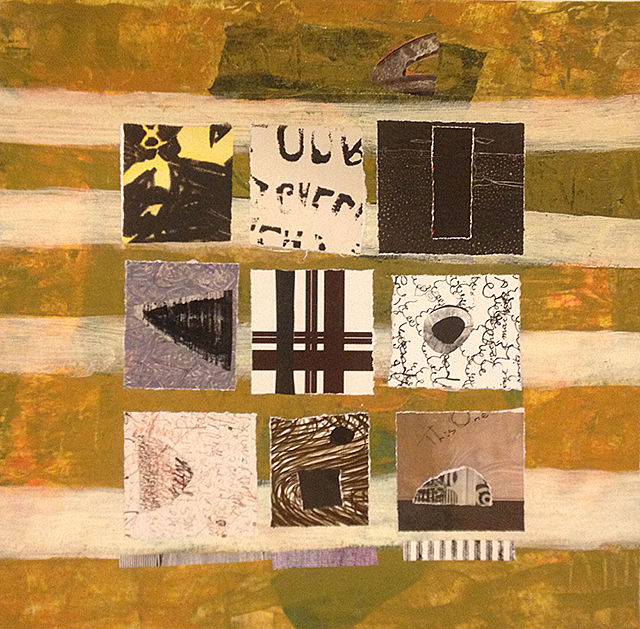 The 2 images below are 2 more small collages on top of hand-made cards on printmaking paper, folded, 8″ x 7″, 2013. The cards were very popular at the show, and priced to sell. It was a good thing that I included the variety I did. Many people loved the pinks and reds of the framed works hung on the walls. Many people were interested in the variety of different works in the art bin. Please visit my website to see 28 images that were at the show. Click on each image to enlarge and get a better view of the detail and collage layers. Follow-up is so important after the trade show closes. I am still contacting designers, architects and others, sending information and image files they’ve requested. A trade show offers incredible opportunities. The networking is amazing. Please contact me if you want more information. I am happy to answer your questions about how to organize work for exhibit in a large show like the Architectural Digest Home Design show. My booth was located in the “MADE” section with more than 150 designers, artists and craftsmen – from lighting, fine crafted furniture, photography, sculpture and fine art paintings and collage. I think I will participate in the show again next year. 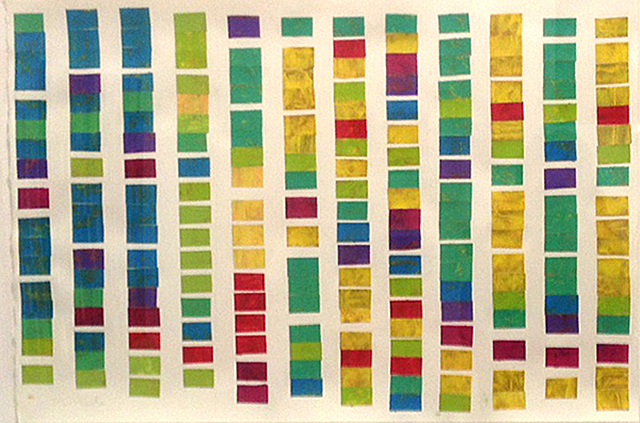 I will probably play with painted paper collage in the studio, and explore the idea of DNA paired as blocks. I am intrigued with mixing art and science. Do you think art and science work well together? Many people do. Thank you for reading and for your comments.